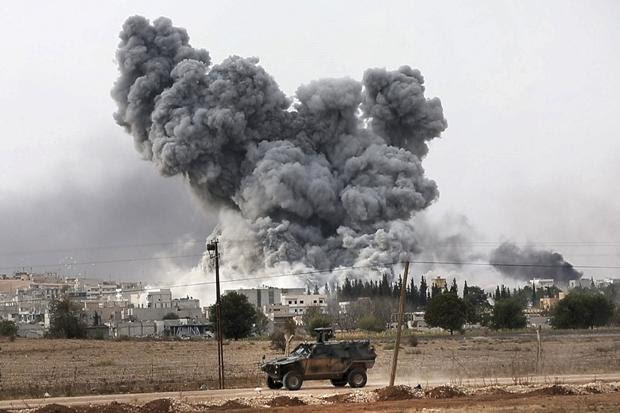 Kurdish fighters have faced a series of car bombings in Kobani as Islamic State forces change tactics in their attempt to take control of key central neighbourhoods in the pivotal border town. The militants detonated four car bombs on Saturday, and a fifth was destroyed by a coalition airstrike before it reached its target. YPG, the Kurdish militia, managed to identify and repel several more attacks. The long-range artillery assaults that Islamic State (Isis) deployed during the first days of the fight for Kobani, on the Syrian-Turkish border, have largely been replaced by gun battles in the town streets. Even so, crowds watching the battle from a hillside in Turkey were forced to move yesterday afternoon after three shells landed near by. The battle for control of the besieged town has reverberated across the region. Turkey was gripped by the deadliest riots in a decade last week as Kurds demonstrating against the Turkish government’s refusal to intervene triggered clashes in which 34 people died.